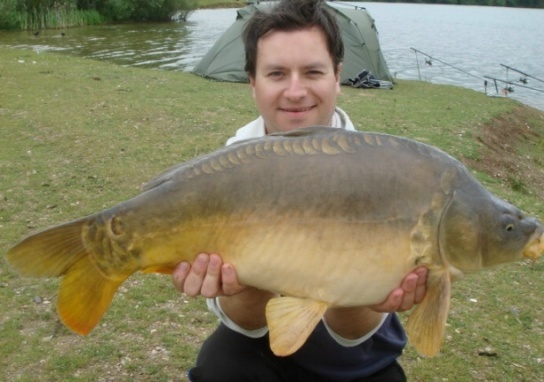 The use of boilies or other convenient baits remains very popular with many carp anglers in the UK. Some will use certain particles but they’re usually the pre-prepared types available in the tackle shops, and many carp have seen, and probably eaten, these forms of bait on numerous occasions. It’s Good to be Different! To be successful at catching the bigger carp in your lake, you may need to give yourself an edge, something that other carp anglers are not doing, and probably won’t be doing some time in the near future. This practice can also include baits. Fishing for carp with a unique bait can give you that edge on your local water, but you need a different bait which can be fed generously to carp, yet won’t cost the earth - particles fit this bill nicely! Another Bradley's Mirror Using Particles! Particle baits have been used to catch carp for numerous years, even before boilies came along. I use particle baits a lot for my carp fishing sessions, and I do believe that in the right situations and at certain times of the year, they can become the secret bait for catching the sought-after fish. The beauty about preparing your own particles at home is you can adapt and mix your selections to form a completely unique food source, which can then be used for a baiting campaign lasting the entire fishing season. To create an even more complex and unique bait just add a few liquids and /or attractants to them during the cooking process. There are many forms of particles that can be used when fishing for carp in UK waters, these range from seeds, grains, pulses (beans, peas, etc), nuts, pellets and other smaller items. These can be a great attractor for carp providing your local lake or syndicate water allows their use! So what are the different particles that can be used for carp fishing? This is not a comprehensive list. There are numerous other types of particles not listed here. There’s also the issue of cooking them properly so as not to damage any carps digestive system in any way. We do have a GUIDE FOR PARTICLE PREPARATIONS. Many particles are best prepared using a pressure cooker as this will cut down the time and help keep most of the nutrients within the particles after the cooking process. Most particles need a good soak for many hours before they can be cooked properly. They should also be soaked for the correct amount of time before cooking, and you should not skimp on this process at all because poorly prepared particles not only cause damage to carp, they probably wont eat them anyway! Particles will often take in lots of fluid during the soaking. They can sometimes become twice as heavy or some will double in size. It’s best to be prepared for this by overfilling the water level a little, and make sure there’s plenty of space left in the bucket or container used for soaking. It is also a good idea to use your lake’s water for soaking and cooking, I personally don’t do this all the time because I don’t always have the lake water at hand, but it’s the best way to prepare particles that will feel natural to carp. Always add some salt during the cooking process (I use 1 teaspoon per kilo dry mix). Adding salt too early may toughen up the skins of pulses (beans/peas), and this makes it difficult for the water to penetrate them. If you’re ever unsure about the time for soaking any particle, simply check them daily and cut one in half to check how moist the centre becomes. When it’s virtually moist all through, then cook them. Add one or two liquid food products after cooking your particles, but don’t overdo them! Add a level teaspoonful of bicarbonate of soda per kilo of dry mix during the soaking stage of preparation. This will help soften the skin of the bait. Kidney beans contain toxins that may harm fish. It is essential that they must be cooked for at least 20 minutes! Using particle bait for carp fishing is usually best done in the summer months. They can be used all year round, but they tend to work best in the warmer weather when you can spod out a good sized bed of bait. They are also very cheap to buy so anyone can sustain a baiting campaign test for many months. The only downside with using particles for carp fishing is that they are not easy to get into the swims. You can spod it out but it’ll take a good few hours to put out 15 kilos or more into a swim. I only pre-bait lakes with particles if bait boats are allowed. This means I can put out plenty fairly quickly and sometimes in the dark so other anglers don’t see where exactly I’m putting it. I have boated it out before in the day, but then nearly had a heart attack when I turned up a few days later to find 2 other guys fishing the swim and casting to the exact area where the bait went in, and this was in an unpopular peg as well – go on… take a trip to France, I’ll look after your favourite swim! What's the Best Bait Choice for Each Fishing Situation? What Are the Best Particle Baits for Attracting Fish? Low-cost Effective Baits That carp Will Love to Eat! What's Best Size Boilie to Use for Catching Bigger Carp?